Our pet depends on us (dog owners) for the health and long life, a lot of owners abdicate their duty when it comes to keeping our dogs healthy. According to the American Veterinary Dental College, it’s predictable that many of our dogs show signs of periodontal disease by just three years old. Periodontal disease is the root causes of some serious health problems our furry friend goes through, so it’s necessary to maintain adequate oral hygiene. Don’t forget that untreated dental disease can result in tooth loss, which may lead to painful swelling and general infections throughout your dog’s entire body. When it some to your dog teeth, there are a couple of important things to be aware of before the actual cleaning process. Examine for plaque along the gum line, this is bacteria that have been forming for quite some time and it is fairly easy to detect. If you observe darker spot around the gum line then you know your dog has a plaque problem. It takes about three or five days before plaque becomes evident and it can be very hard to remove if not taking care of quickly. Even as we are going through busy schedules were work or kids (or both) demand our attention, and free time is at a premium, neglecting your dog’s teeth is not necessarily an option, there are ways to cut corners without spending time or money at the vet clinic until it is time for her annual check-up. The following are five of those options. 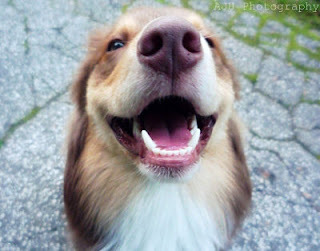 Dog Teeth Treats: dental treatments are a great way to enhance the dental health of your dog. These treats are particularly made to get rid of plaque buildup. They are usually highly more appreciated by our dogs than toothbrush or tooth wipes and do a great job of keeping our dog's mouth clean. These treats come in a diversity of shapes, flavors, and sizes, and you are sure of getting something your dog likes. Dental chews: This has been around for a while and is similar to raw bones and hard vegetables in keeping dog teeth clean and free of plaque. Ask your veterinarian for recommendations, or browse online for chews that have been clinically tested and proven to reduce tartar build-up on dog teeth. Look for those chews made-up in sizes and shapes to fit your dog’s mouth and those containing supplemental vitamins and minerals. Dental Wipes: This is textured clothes that have been pre-saturated with ingredients to facilitate the removal of plaque and tartar. For a lot of dogs with small mouths, this is one of the ways to help keep the teeth clean. In addition, dogs that dislike brushing may be more likely to allow it owner wipe their teeth instead of using a brush. Brushing at home: In around 5 minutes of your time, brushing your puppy's teeth at home on a consistently will help get rid of the plaque, reduces the accumulation of tartar and keeps your dog breath smelling good. Home brushing also reduces the number of bacteria that can create disease in your puppy's mouth and internal organs. You will need a normal dog's toothbrush small enough to fit into your dog mouth, as well as dog toothpaste such as all-natural vanilla-flavored toothpaste. Water Additives: This natural water additive can be poured straight into your dog's bowl so that each time she drinks, the different organic components can refresh her breaths and remove any food particles or plaque buildup that stick to her teeth. The additives that contain fatty acids salt can reduce the growth of bacteria that cause gum disease, while added baking soda fights bad breath and removes food particles and plaque. Raw Bone: Raw meat bones not just serve your dog as a delicious treat full of minerals and other nutrients, they also work with your dog chewing action to help keep her teeth clean. Friction caused by the dog teeth working the hard surface of the bone scratches away any available food particles, dental plaque, and avoids tartar accumulation. Furthermore, certain protein enzymes found in raw bone work to hinder the growth of oral microorganisms, thus maintaining your dog’s fresh breath.